Noda appears later in the series. He has the Alice of time-traveling. Seems to like appearing out of nowhere, but in fact, it's because he often cannot control when he is going to disappear or appear - caused by faults in his ability. 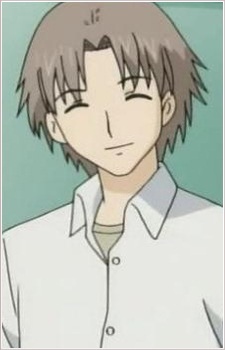 He is an easygoing and carefree teacher; that is why the Special Ability type students like him so much. It has been hinted that he also knew Mikan's mother and father very well. He is the moderator of the Special Ability Class. His ability control device is a bangle he wears on his wrist, which was put on him by the Elementary School Principal, perhaps to stop him being able to control his Alice well, so that he wouldn't be able to show Mikan her past.